Famous Amsterdam city landmarks are the Dutch Royal Palace, the NEMO Science Centre and the Concert Hall. 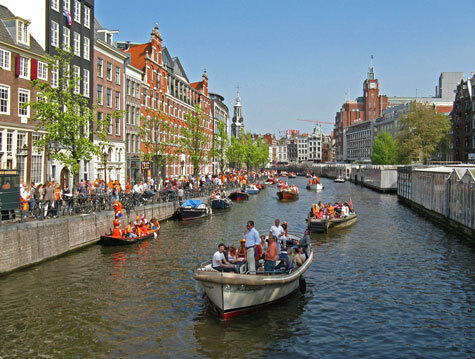 Other Amsterdam attractions include Anne Frank's house, the Aquarium and the Heineken Brewery Tour. The Van Gogh Museum, Tropics Museum and Rembrandt Museum are three popular destinations. Discover the many colorful districts of the Netherland's largest city. Don't miss Centrum and Golden Bend! Excellent hotels and guest houses can be found in downtown Amsterdam and throughout the city. Amsterdam's Schiphol Airport is one the Europe's four gateway airports. Airfares to Amsterdam are inexpensive. Excellent public transit is available throughout Amsterdam. You can also rent a bike to get around!